it was felisol's [http://felisol.blogspot.com/] dear mom's birthday july 2 and here it is july 6 and so we will have to wish her a belated happy birhday...actually it is five days late because in her beautiful country of norway it is already july 7! that's all right though because she knows that we love her, even though i am a little on the slow side! now mom ljung is a blessed lady indeed..and so is her family...here she is with felisol, gunnar, kel, and princess serina!...in all of their arms! her dearest husband who has gone on before and lives in heaven now is still always in her heart and so i have put him here in the picture. 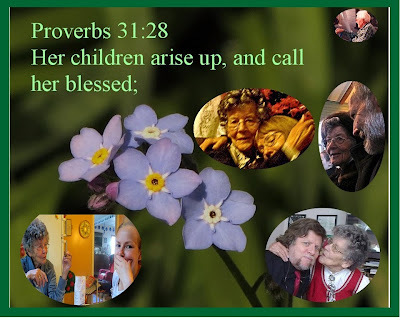 the blue forget-me-not flowers are her own..i lifted them off felisol's blog site! and now, i am giving her for a birthday gift this little video..once, several months ago i put this same video in for amrita's mama but i don't think that mama will mind sharing it with mom ljung...it is such a cute scene! 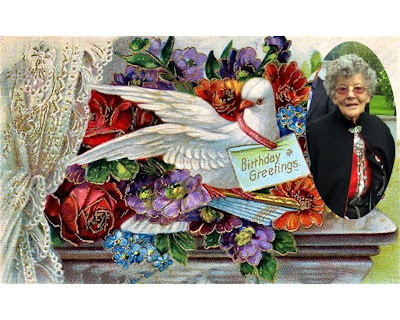 and NOW i had better go to google image and find me a birthday cake for this dearest of dearest lady who lives with her children on the far side of the sea! Happy birthday to Monten dearest, such a talented, creative , strong, and explemplary woman of Norway. I really admire her hand made traditional garments and hand painted crockry and decorations. Mother is full of life an d zest and enjoys family times. Yerry that video is so cute. Thank you for this beautiful greeting for my Mom. The video can not be shown in our country due to copyright reasons, says the black writing on the wall. Can you imagine that little Norway shall be of such importance? Nevertheless, you are the birthday queen of the blog world, Terry. Happy belated birthday wishes to Felisol's mom .. and for the chance to 'meet' her through our dear Norwegian sister. We are blessed to be friends with such a special lady. Well .. that moose video is just too cute to pass up. Sorry that it wouldn't play in Norway.